called one of the most prolific strikers by whoever wrote the wikipedia article, romario is still playing association football (soccer) for vasco de gama in his home country of brazil (or is it brasil?) at the age of 41. vasco de gama is also the team where he got his professional start in 1985. as a footballer in vasco’s league, the rio de janeiro state championship, romario won 4 state championships and won the scoring title 7 times. he went on to play dutch league soccer where he won 3 championships and 3 scoring titles in 3 years. in the copa america tournament, he led brazil to 2 victories with 2 scoring titles. he took brazil to the 1994 world cup and helped lead them to victory, being named the most valuable player. in the same year he won fifa player of the year. he was also the brazilian league’s top scorer 3 times and brazilian cup’s top scorer twice. his last scoring title was in 2005, which he won at the age of 39. also, he helped his brazilian team secure 3rd place in the fifa beach soccer world cup in 2005.
on the brazilian national team, he paired with ronaldo to be a super-scoring duo. in one game, they both recorded hat tricks to lead brazil to a 6-1 victory. supposedly this duo is affectionately called ro-ro but i feel everything besides affection when i hear (or read) that. diego maradona has said that romario would be on his all-time dream team — i imagine he would have romario play striker alongside maradona’s fist. pretty good career. turns out it’s still going strong. 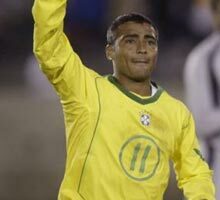 romario is on the verge of scoring his 1000th goal. he has 998 and hopes to score 2 more in this weekend’s vasco-flamengo game. he thinks that would be special because pele scored his 1000th goal in the same stadium. (pele is the only soccer player known to score over 1000 goals — he has like 1260 or something.) there have been questions about whether romario’s count is accurate. for instance, he included goals from two brazilian championship games that were declared void, goals in matches that are said to never have occurred (which he later subtracted), goals in friendly matches between vasco and teams like “friends of aldair,” goals in festive matches like the one that feature the brazilian world cup team from ten years before versus a team of retired mexican professional footballers, and goals scored when he was a youth playing in youth leagues. apparently, 7 of the 998 goals were scored when he was 13 years old and playing in a kid’s league. other people think the number is less impressive because he joined some minor league teams in the united states and australia over the last few years to score more goals. according to some, 77 total goals were scored in youth leagues and 172 were scored in non-competitive games, leaving his number of goals in competitive club soccer or international soccer at 749.
and i say, big deal if some weren’t professional games. he’s had a pretty impressive career. in dutch soccer he scored 30 goals in 33 matches. with miami fc he scored 18 goals in 22 matches. in world cup play he scored an amazing 55 goals in 70 matches. only pele and ronaldo (fat ronaldo) have scored more. 1000 is just a number anyways. the number isn’t the big deal. he just has a goal of scoring 1000 goals and he can count goals however he likes. they’ve all been in scored in soccer games. it’s not like he’s counting goals scored in his backyard by himself. so i hope he scores 2 goals this weekend and has a big party to celebrate his accomplishment. former teammate claudio adao said, “It’s a joke. If I count the goals I scored before turning pro I would have 1,000 goals, too.” i doubt it, claudio. maybe if you didn’t spend your career injured.